I found this sweater at my local thrift. 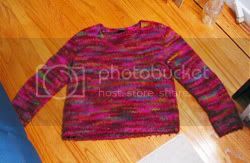 It was an Ann Taylor handknit sweater made of 61%wool, 30% acrylic, and 9% nylon. I loved it's feel and colorway so frogging had to happen. This sweater really showed me again how necessary washing recycled yarn is. When I was frogging, my friend Paulie was over (he's horribly allergic to dust mites). He started having a horrible allergic reaction (sneezy, sniffly, etc). 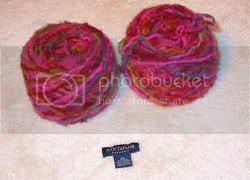 So always wash your recycled yarns!